Goat anti Human IgG F(ab')2:Alk. Phos.  Goat anti Human IgG F(ab')2 antibody will recognize both the heavy and light chains of the F(ab')2 portion of human IgG by IEP. This product will also react with light chains from other human immunoglobulin types. This antibody has been cross adsorbed against the Fc domain and will react with less than 1 % of the Fc domain of human IgG. This peroxidase-labelled antibody is a performance tested, matched reagent for HuCAL antibodies. Stable for 6 weeks at 4ºC as an undiluted liquid. For longer term storage (>6 weeks) please add an equal volume of glycerol and store at -20ºC. Avoid freeze-thaw cycles. Wang, Y. et al. (2011) Small interfering RNA knocks down the molecular target of alendronate, farnesyl pyrophosphate synthase, in osteoclast and osteoblast cultures. Mol Pharm. 8 (4): 1016-24. Ohashi, M. et al. (2010) Post-translational modification of the NKG2D ligand RAET1G leads to cell surface expression of a glycosylphosphatidylinositol-linked isoform. J Biol Chem. 285 (22): 16408-15. Thiede-Stan, N.K. et al. (2015) Tetraspanin-3 is an organizer of the multi-subunit Nogo-A signaling complex. J Cell Sci. 128 (19): 3583-96. Mukbel, R.M. et al. (2016) Human immune response to salivary proteins of wild-caught Phlebotomus papatasi. Parasitol Res. 115 (9): 3345-55. Protein Eng Des Sel. 25 (5): 251-9.